I'm going to try to fit it all in one post if I can. So much going on and I have some other posts in the works so without further ado..have you seen this? Back in November, I think, Joy and Isabel and I were talking about how much fun it would be to have a blog party where we could meet local bloggers in person. We were going to try to do it in December, but with the snow and holidays it just didn't make sense. So, now it's all planned and we are committed (or maybe we should be-ha ha). I think it will be great fun to meet some of you who I have only known through comments or by reading your blogs. If you would like to join us, and I hope you will, you can RSVP to me here in my comments or to Joy or Isabel or Martha. I guarantee a good time will be had by all. 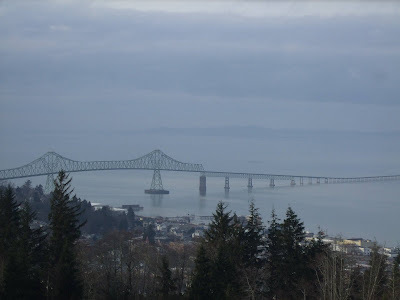 After the success of our last family outing to the beach, we decided to make a day trip to the city of Astoria. I had never really visited this lovely town that is rich with history, so off we went. First order of business, find all the thrift stores. Fortunately it was pretty easy to find them and I was able to find several great items for very little money. More on that later. We were starving so we decided to have lunch at a lovely restaurant called "Baked Alaska" that was right on the water. I had some delicious clam chowder and a fancy green salad. Next we decided to visit the Flavel House. It was built by a retired sea captain and it was just lovely. Unfortunately I didn't get any pictures of the inside, too dark, but the furnishings and the wood work was amazing, trust me. 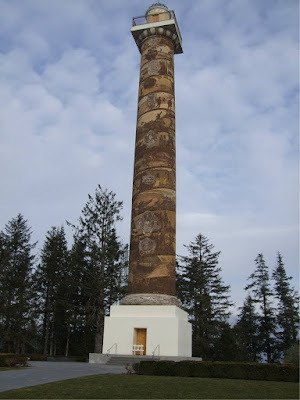 Our next stop was the Astoria Column. Great views from up there even with the cloud cover. Finally, we drove out to Pier 39 and had some hot cocoa at the Rogue Brewery. Okay, hubby had a beer while the rest of us had hot chocolate. A great ending to a fun day. Now for the part you have been waiting for. My thrifty finds. Well, that wasn't as long as I thought it would be. Not much planned for this week yet. Just the usual thrifting, trip to Monticello, a little housework thrown in. Not too exciting, but I am going to try to get going on a project I have been planning. We'll see how that goes. Have a great Monday! I'm going to try and get some girls together to come to your blog party. The distance is a problem but I'm working on it! Love the pictures of the coast. I'm sooooooooooo ready to go over there and hang out. We are going to try and do a week on the Oregon Coast this summer. Great finds! Love all the trims. I'm a huge sucker for trims. Well trims, fabric, buttons, or whatever! Count me in for the blogger party. It sounds like fun! Let me know if there are any more details. I love Astoria. If you go there in the summer there is an awesome fish and chip rest. called the Bell Buoy (I think that is the name). It is across from the maritime musuem and is located in an old boat in a grassy field. It is delic.! Oh I wish I lived near you! I would come to your blog party and I would also love to shop in your little shop! You get the best bargains! You don't find those very often here in southern calif.
Me too I want to come to the party!! Oh yea, I am.. Are you going to Monticello on Wednesday? I am meetining Timi there can you join us for lunch? Wish I were in Oregon so I could come! Sounds like its going to be a blast! Hope all is well, just though I'd stop in & say hi! OMG How fun! I wish I could come... We're going to be down in P-town the first weekend in March and coming back in April for expo. I'm planning to get to Monticello and buy buy buy. I'm working on saving my dollars so I can blow my wad down there! I wish I was up there so I could come to the party! I'll be there in spirit! 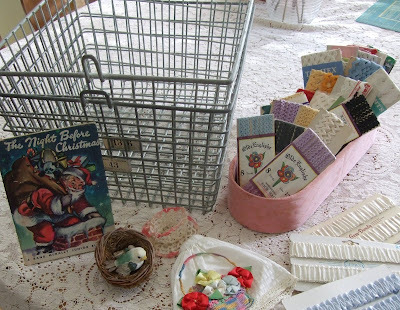 Love your vintage finds... $2.00 locker baskets!! Awesome! Count us in for the party!!! Oh how I would love to meet up with you the other local bloggers on Saturday but I can't. Will you do it again sometime? P-l-e-a-s-e? I hate to miss out on the fun but I'll have to this time. Loved your photos from Astoria. We lived there for nearly four years when our kids were little. 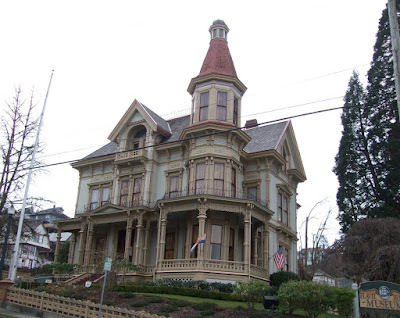 We lived just up the hill from the Flavel House. You can see our house from the top of the Column. In fact, the window in our bathroom had a view of the Column! I'd love to still have that house. What fun I could have filling it with treasures. Now that I don't live there anymore I know exactly what I would do with it. Too late we get so smart! Have fun on Saturday. Can't wait to hear all about it.